Amity University is a private university located in Jaipur, Rajasthan and was established in the year 2008. The institute is approved by All India Council of Technical Education (AICTE) and The University Grants Commission of India (UGC). 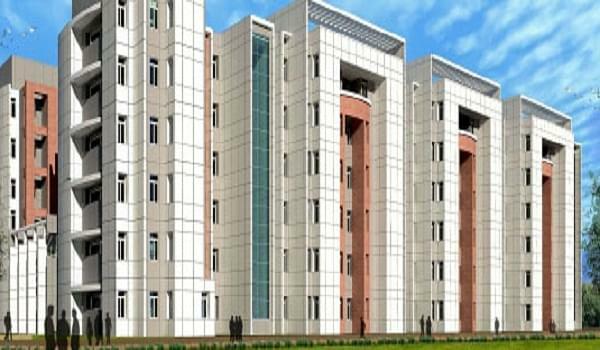 Amity University is also accredited by Bar Council of India (BCI) and Council of Architecture. The Institute offers various UG, Integrated, PG, PG Diploma, M.Phil. and Ph.D. courses. Admissions to most of the courses will be done on basis of Entrance Exams conducted by the University whereas for few of them, scores obtained in External Entrance Exams will be considered. Admission to UG and Integrated programs are done on the basis of marks acquired by a candidate in 10+2 (relevant stream) or equivalent. CBSE or equivalent – Minimum required marks (for Bachelor of Interior Design, BA, B.Sc., BCA, BCA + MCA, BA (Hons.) English/ French/ Applied Psychology, B.Des. (Fashion Design), Bachelor of Fine Arts, BHM and BHM + MBA). CBSE or equivalent – Minimum 50% marks (for B.Arch. and BA + LLB (Hons.)). CBSE or equivalent – Minimum 55% marks (for B.Sc. (Hons. ), B.Com. (Hons. ), BA (Hons.) Economics, BBA LLB (Hons. ), B.Com. LLB (Hons.) and BBA). CBSE or equivalent – Minimum 60% marks (for B.Tech. and B.Tech. + M.Tech.). Amity Entrance Test – Valid Score (B.Sc. (Hons. ), BA LLB (Hons. ), BBA LLB (Hons.) and B.Com. LLB (Hons.)). Amity Design Test – Valid Score (Bachelor of Interior Design). Amity Creative Test – Valid Score (B.Sc. (Animation & Visual Graphics), B.Des. (fashion Design) and Bachelor of Fine Arts). Amity JEE Entrance Exam – Valid Score (B.Tech. and B.Tech. + M.Tech.). NATA Entrance Exam – Minimum 80% marks (for B.Arch.). Final Selections to UG and Integrated programs are done on basis of scores obtained in Entrance Exam followed by Group Discussion/ Personal Interview conducted by the University. Admission to PG and PG Diploma programs are done on the basis of marks acquired by a candidate in their Bachelor’s Degree Examination (relevant stream) or equivalent. Bachelor’s Degree or equivalent – Passing Marks (for M.Tech., MA, PG Diploma, MCA, Master of Fine Arts, M.Sc. and Master of Tourism & Travel Management). LLB or Equivalent – Minimum Required Marks (for LLM). 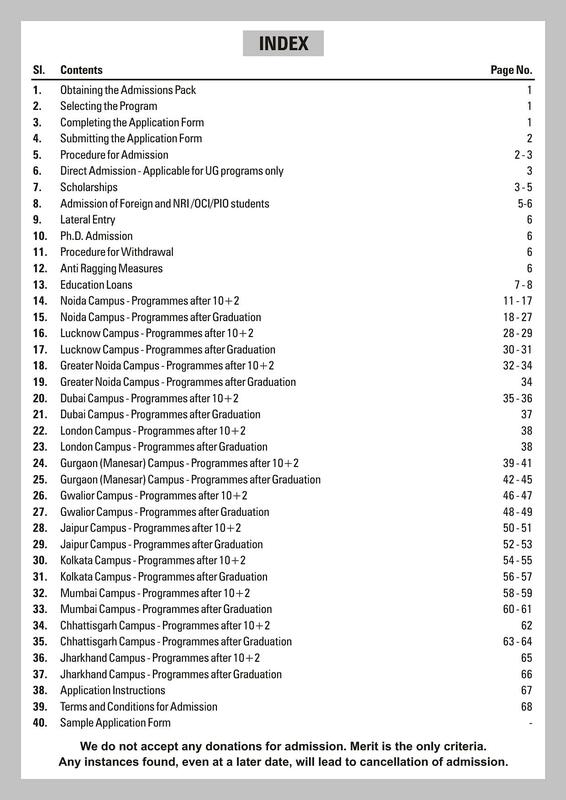 Bachelor’s Degree or equivalent – Minimum 50% marks (M.Sc. (Ocean Atmospheric Science & Technology), M.Com. and MBA). 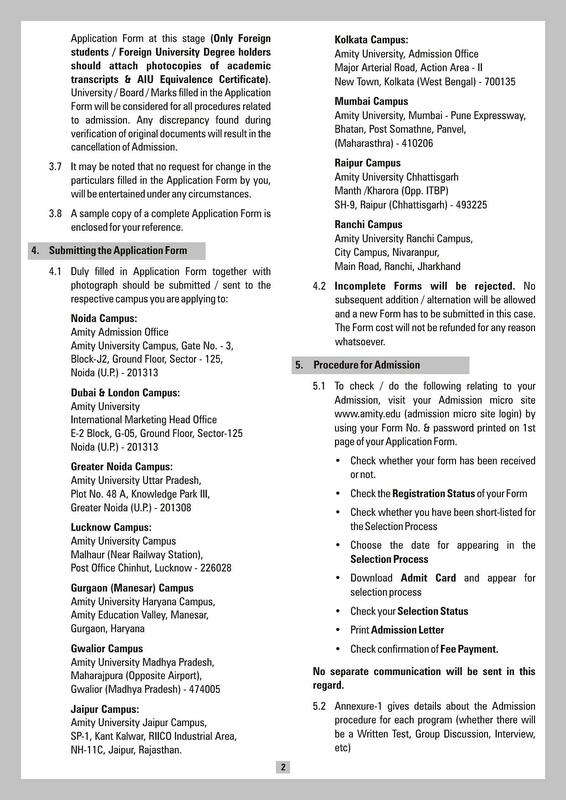 Amity Entrance Test – Valid Score (for M.Sc., M.Tech., MCA and LLM). CAT/ MAT/ XAT/ NMAT/ GMAT – Valid Score (for MBA). Final Selections to PG programs are done on basis of scores obtained in Entrance Exam followed by Group Discussion/ Personal Interview conducted by the University. Whereas, selection for MBA program is done on basis of scores obtained in CAT/ MAT/ XAT/ NMAT/ GMAT Entrance Exam, Group Discussion and Personal Interview conducted by the University. Entrance Test followed by Personal Interview conducted by Amity University. Amity University offers Placements opportunities to candidates through their Placement Cell, a working body which counsels and provides training to the job aspirants before appearing for an interview. 100% Scholarship to candidates scoring 93% and above marks in 10+2. 50% Scholarship to candidates scoring 88% and above marks in 10+2. 25% Scholarship to candidates scoring 80% and above marks in 10+2. 100% Scholarship to candidates scoring 93% and above marks in Graduation (for Non MBA courses). 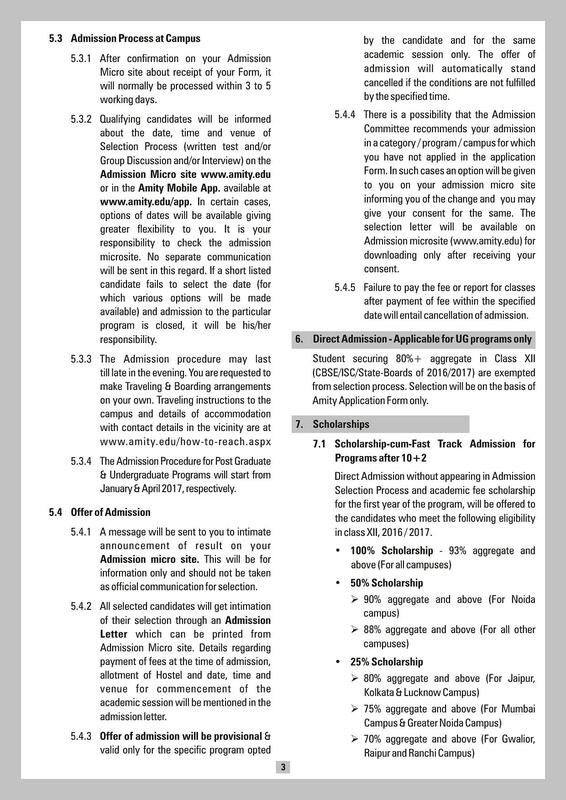 50% Scholarship to candidates scoring 88% and above marks in Graduation (for Non MBA courses). 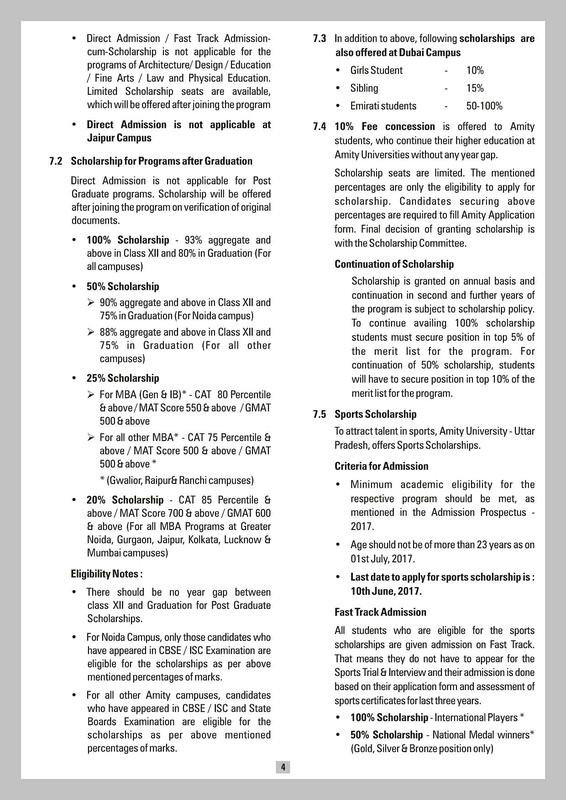 20% Scholarship to candidates scoring more than 85% marks in CAT/ 700 marks in MAT/ 600 marks in GMAT (for MBA programs). Indoor and Outdoor Equipment and Facilities. 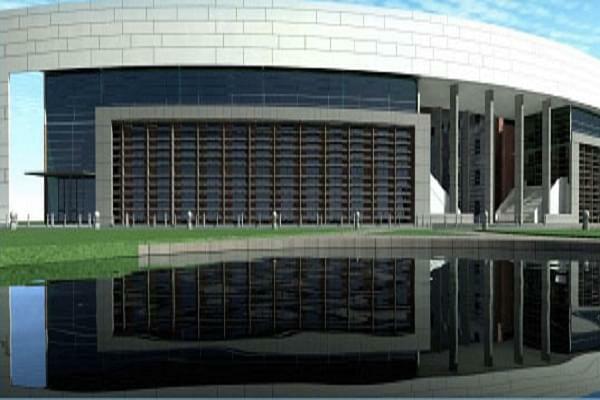 Auditorium with intake capacity of 368 students. Moot Court for LAW students. Laundry Services for Hostel Residents. college management (faculty)was good but not for our batch. management of our was lazy so you have to be perfect while submitting our documents. The college management was amazing. The environment was nature loving and pure. I enjoyed all my 4 years in the college. I learnt a lot new things and made new friends from different parts of the country who are still connected to me. The good things about the college is about its surrounding and infrastructure. Management of the college is very well defined in a proper way. What does BFA Course stand for? Hi Vasu, The BFA stands for bachelor in fine arts. Please tell me LLB course. I completed B.com form D.U. Hi Vikram, This University does not offer LLB course. 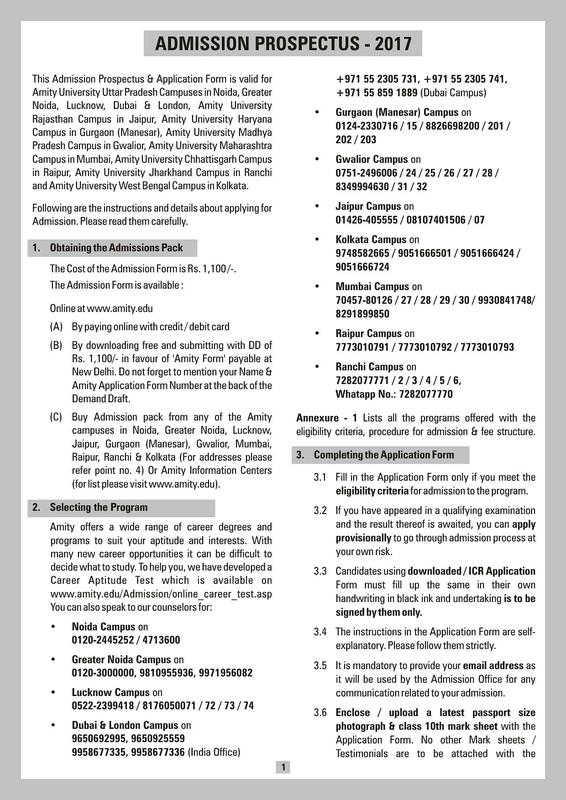 WHAT ABOUT ENTRANCE FOR M.C.A ARE THIS CAMPUS TAKING ADMISSION TEST OR NOT? ARE THEY NEED 12TH WITH MATHS SUBJECT? My son has applied in your college and we have sent two Demand Draft to your city office and they confirmed also. But still no confirmation from your college. Kindly confirm the same. Hi Shyam, I am giving to you the contact no of this college so please contact on this no: 01426-405678, 2372489, 2374595. "One of the best Law College in the city"